Protect yourself from a bad investment. Including: junk, salvage, total loss, etc. RigDig Truck History Reports dig deep, powered by the most comprehensive and most trusted information sources available. RigDig integrates information from Junk Yards, Salvage Yards, Auto Recyclers, Insurance Carriers and State Titling Agencies from the National Motor Vehicle Title Information System (NMVTIS). The Federal Motor Carrier Safety Administration (FMCSA) is RigDig’s primary source of federally recordable accidents, post-accident inspections, inspection violations and carrier information. RigDig Business Intelligence is the primary source for vehicle specifications. Additionally, it provides all the labor, resources and magic to tie a VIN with the associated carrier. Equipment Data Associates (EDA) is RigDig’s primary source of Uniform Commercial Code (UCC) related liens and terminations. RigDig protects you from purchase mistakes and helps you make smart buys. Eve ry truck has a story to tell. It might have been in a flood. It could have a junk title, a history of poor maintenance, or even been involved in an over-turn accident. 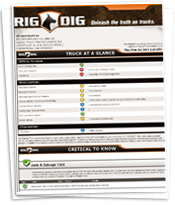 Protect yourself with a RigDig truck history report. RigDig reports are affordable and powered by the most comprehensive and most trusted information sources available. You get vital intelligence to make smart buys in an easy-to-use report. Whether you’re a fleet manager, dealer, or owner-operator, you need a watchdog. See a sample report.